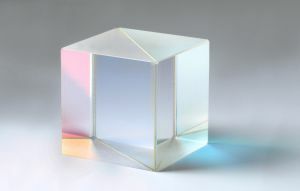 Due to their optical contacting these narrowband cubes, which are real cubes and no quaders, are suited for higher laser powers. They are working in the same way as normal polarizers, i.e. they separate the S and P polarization components by reflecting the S component at the beamsplitter coating, while allowing the P component to pass with an extinction ratio of Tp:Ts > 1000:1. Extinction Ratio: > 1000:1 for an acceptance angle +/- 1 deg.